The configuration of the new EMU bike cars is controversial because seating and bikes are not currently planned to be located together on the same level, which prevents riders from keeping an eye on their bikes and increases the risk of theft. A workshop is planned to resolve this eyes-on-bikes controversy. Clouding the issue of eyes-on-bikes theft deterrence is another hot-button issue with the bikes-on-board crowd, bike capacity. In 2015, under sustained pressure from bike advocates, the Caltrain board of directors made the unusual decision to override the staff-recommended seat:bike ratio of 9:1, imposing instead a ratio of 8:1 to be written into the Request for Proposals (see meeting minutes, pp 6-15.) The initial six-car EMU order was procured under this requirement, resulting in a configuration with 567 seats and 72 bike spaces. Fast forward to 2018, and an option order placed to stretch the EMU fleet to seven cars did not include additional bike space. 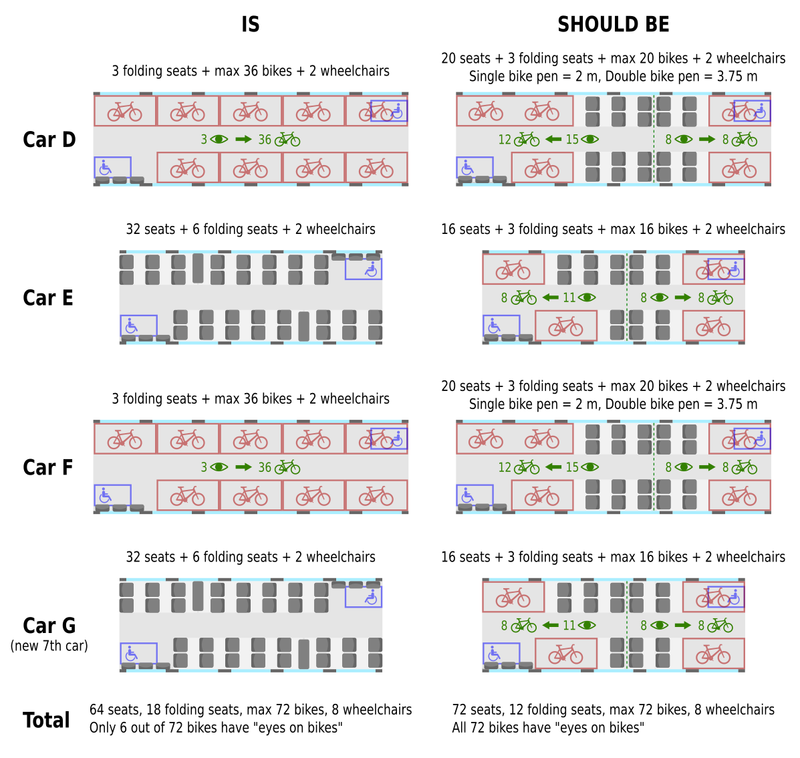 The result is a train configuration with 667 seats and the same 72 bike spaces, resulting in a ratio of 9.3:1. While the 2015 board directive concerned only the wording of the RFP and only implicitly established a bike capacity policy, bike advocates are upset about a perceived bait-and-switch, despite the increase in peak-hour frequency from five to six trains per hour per direction. To have any chance of resolving these two issues, the bike community needs to attack them separately. Tying the reconfiguration of the bike cars for better theft deterrence to a bike capacity increase is a losing proposition, given the increased resistance to more bikes-on-board from staff and the new board. With increasing crowding, it may make less sense to allow passengers to bring bikes on the train. For now, let's set aside more bikes and deal with theft deterrence first. All bike spaces will be located on the lower deck of the bi-level EMU cars. All cars have an interior width of 2.80 m and must have an ADA-compliant 32" aisle. The D and F cars (longer unpowered cars) have an available lower deck length of 10.03 m.
The C and G cars (shorter powered cars) have an available lower deck length of 8.37 m.
Eyes on bikes: where possible, seating shall face towards the bikes. Bike pens (capacity 4 bikes) are sized 2 m long by ~1 m wide. Double bike pens (capacity 8 bikes, without a divider) are sized 3.85 m long by ~1 m wide. They provide the same interior room compared to two single pens placed end to end. Bike pens, or at least bike partitions, are required for crashworthiness, if seats are going to be facing towards the bikes for "eyes on bikes." This prevents a pile of bikes from ending up in someone's lap in the event of an emergency stop or collision. Same-direction seat pitch is 32.5" or 82.5 cm. Back-to-back seats require an additional 6" or 15 cm of clearance to accommodate the slight recline of the two seat backs. Two wheelchair spaces must be provided in each car. One wheelchair space may overlap with a bike pen (dual purpose space, priority to the wheelchair user) per precedent in the existing layout. It is preferable to minimize the number of different car configurations. With these rules in place, one can go about re-configuring the bike cars. Suggested EMU lower deck layout to achieve 100% eyes-on-bikes. The bike car reconfiguration represents an opportunity for Caltrain. On one hand, it allows Caltrain to claim they are responsive to stakeholder input, and on the other hand, it gives a legitimate pretext to add a bit of delay to the EMU order, thus opening up some breathing room in the program schedule for electrification construction, which is falling badly behind. It has always been the intent, as funding allows, to extend the trains to 8 cars. 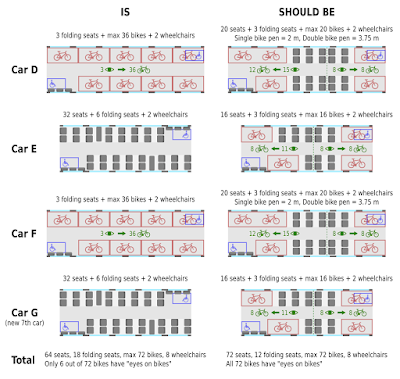 Should the bike ratio continue to be controversial, the eighth car could be configured exactly as the D and F cars in the diagram above, providing another 20 bike spaces for a total of 92 per train. The seating capacity of the entire train would be 778, yielding a compromise ratio of 8.5:1, halfway between the preference of Caltrain staff (9:1) and the preference of bike advocates (8:1). The best compromise is one with which everybody is equally unhappy. There's a slight problem with this equation. Storage for one bike takes up about the same space as one seat, so each biker occupies two spaces on board the train. Everything works out when there is spare capacity, but when a train gets full, the equation starts to break down. 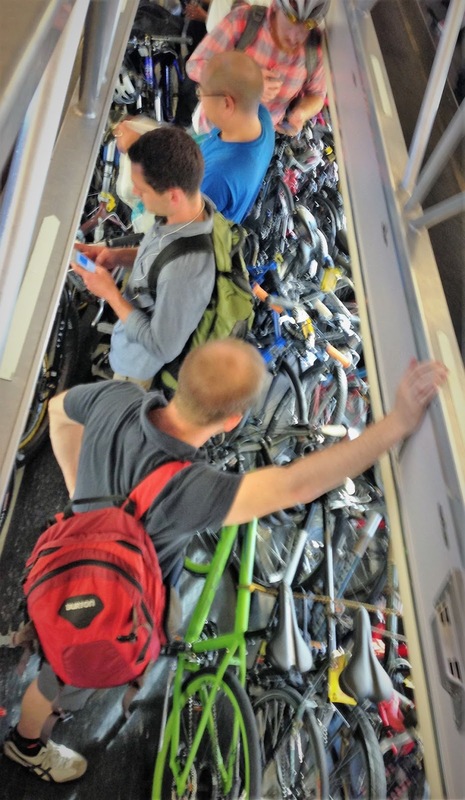 The bikers argue that no regular passenger ever gets "bumped" off the train the way bikers do when the bike car is full, so the worst outcome of bringing a bike on a crowded rush hour train is that somebody else will need to stand rather than sit. How bad can that be? Standing is uncomfortable, which invites the invisible hand of supply and demand. When the train ride at rush hour becomes uncomfortably crowded, passengers will sometimes stop riding. The level of peak crowding is self-regulating; there is an equilibrium level of unpleasantness where each new rider is balanced by another fed-up rider who quits due to crowding. This invisible hand works without a single passenger ever being "bumped" at boarding; the "bumping" in this case is happening at home when a person is deciding whether or not to ride the train that day. Unlike bicycle "bumps," you can't measure how much crowding discourages riders, and you can't count the number of people who won't ride out of concern for not being able to sit. That doesn't mean it's not happening. This is why Caltrain should limit how much bike space is available on board the trains during rush hours. Any additional train cars ordered to increase the passenger carrying capacity of the new EMU fleet should be packed with seats and not a single additional bike space beyond the ones already provided. Peak hour bike commutes should be encouraged by improving station bike parking facilities, as is done in other countries where bike mode share is far higher than the Bay Area. five-mile drive under the Bay in 2011. Boring a new tunnel under the Dumbarton corridor, through muddy soils right under a sensitive national wildlife refuge, seems like an impossibly difficult, risky and expensive undertaking in this day and age. But here's a little-known fact: it's already been done. 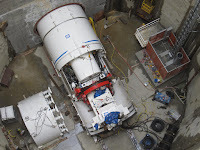 From 2011 to 2013, a 15-foot diameter tunnel boring machine (TBM) quietly bored a new five-mile tunnel under the Bay from Menlo Park to Newark. The $288 million project, the first tunnel ever bored under San Francisco Bay, is part of the Hetch Hetchy Water System and was built to contain a 9-foot diameter drinking water supply pipe that feeds San Francisco and the peninsula. The TBM that bored the tunnel was an EPB (Earth Pressure Balance) machine and advanced so quickly that it had to wait underground at the far end of its drive, while an access shaft was prepared so the machinery could be retrieved. There were few geotechnical surprises along the way, of the sort that can sometimes blow out tunneling budgets and schedules. The geological layers of clay, gravel and rock under the Bay along the Dumbarton corridor are now better known than they have ever been, and any "geotechnical risk" is effectively retired after the actual boring of an actual tunnel. Of course, a rail tunnel would be larger and cost far more than the $288 million water tunnel. To safely carry train traffic at speeds of 125 to 150 mph, two parallel tunnel bores about 30 feet (10 meters) in diameter would be needed, connected by cross-passages about every 1000 feet and with a handful of ventilation and emergency evacuation shafts to the surface. How Much Would a Dumbarton Rail Tunnel Cost? The costing of bored rail tunnels is reasonably predictable, with models having been developed for example by the High Speed 2 project in the United Kingdom. The HS2 tunnel cost model can be applied to estimate the known cost of the Dumbarton water tunnel, as a sanity check. The model uses 2011 British pounds, which we convert to dollars using the exchange rate of $1.57 in 2011. The length of the water tunnel is about 8000 m, and it took about 100 weeks to drive and clear out (100 m/week drive and 400 m/week clear-out). Tunnel construction cost is scaled by bore diameter as indicated by section 4.2 chart G.1; the single-bore water tunnel has 23% of the perimeter of a twin-bore 9.6 m tunnel considered in the HS2 document. Disposal cost is scaled by bore area; the single-bore water tunnel has 11% of the area of a twin-bore 9.6 m tunnel. Note the water tunnel does not require portal or ventilation / evacuation facilities. The HS2 model seems to predict the direct construction cost of the existing Dumbarton water tunnel reasonably accurately, landing within ~12% of its actual cost. Most of that difference can be ascribed to the much smaller boring machine, which the HS2 model cannot account for; the Dumbarton TBM cost about $10M. These overhead rates compound with each other, combining to 53%. The expected all-up cost of a twin-bore Dumbarton tunnel is then about $1.8 billion. Add to that the expense of removing the old bridge, estimated by Samtrans at $150M, and we reach almost $2 billion. As we are often reminded on the peninsula, a tunnel puts the trains out of sight and out of mind. In this case, it actually makes sense to build one because it crosses a terrain obstacle, San Francisco Bay. A new tunnel avoids visual and noise impacts, removes the blight of the old bridge, enables higher train speeds without endangering wildlife, and can be made more resilient to sea level rise than a new bridge. A new tunnel is not much more expensive than the options now being contemplated as part of the Samtrans Dumbarton Transportation Corridor Study, where it was summarily and improperly dismissed as too expensive, risky, burdensome and impactful (see Table 6-4). The tunnel option deserves a second and more serious look. A Dumbarton tunnel could extend under University Ave and Willow Road in Menlo Park, grade separating both for a marginal cost that our model places at $132k per meter of twin tunnel (in 2025 dollars). The Samtrans study estimates each grade separation to cost about $200M (in 2017 dollars), so the two grade separations are worth about a mile of extra twin tunnel if you've already got TBMs in the ground. That's before the grade separations have to be rebuilt to accommodate sea level rise. A Dumbarton tunnel would provide more cost certainty than a bridge. The last bridge the region built overran its cost estimates by several hundred percent, while the Dumbarton water tunnel was on time and on budget. Tunnel boring is a well-developed technology that is highly automated and doesn't use a lot of expensive construction labor. Some people are working on making it even more automated. A Dumbarton tunnel could serve as a key component of a new regional rail link between the Bay Area and the Central Valley, putting San Jose much closer to Sacramento, and San Francisco under an hour from Stockton. It could eventually serve as the entry point of high-speed rail into the Bay Area, making faster trips from anywhere in the Bay Area to Sacramento and southern California. The performance simulation at right shows a high speed train passing through Tracy just 35 minutes after departing San Francisco Transbay, traveling along the Altamont SETEC alignment. This would vastly simplify the "blending" of Caltrain and high-speed rail since the latter would enter the peninsula rail corridor at its midpoint, sharing slow tracks for only half the distance of the existing plans and requiring fewer overtake maneuvers. A new Altamont / Dumbarton high speed regional rail link could replace and combine the fragmented hodge-podge of projects and agencies variously pushing Altamont Commuter Express extensions, Valley Link, Livermore BART, a second BART Transbay Tube, the high-speed rail system, and whatever Cross Bay Transit Partners might come up with for Dumbarton, each of which nibble at different edges of the same basic problem: our regional mobility is inadequate and relentless traffic jams are crushing the souls of hundreds of thousands of people in the I-580, I-680, I-880, US-101 and CA-92 corridors. The Dumbarton rail corridor needs to be thought of as so much more than a simple bay crossing that relieves traffic for people who work at Facebook. This is a one hundred year piece of infrastructure that can unclog an entire region, and it needs to be engineered for it. A tunnel for $2 billion (in 2025 dollars) is a sound and future-proof investment. The latest tweaks to the design of the San Francisco Downtown Extension (DTX) rail alignment can be seen in a March 2018 track plan and profile drawing. Because it largely follows the street grid, it's no secret that the alignment is full of sharp curves, which can only be traversed at slow speed. However, compared to a 2012 drawing, speed limits have dropped in several places from 40 mph to just 30 mph, because train speed evidently isn't a design priority when civil engineers get a blank check. Back in 2012, the speed profile sort of made sense: starting from the basement of the Transbay Transit Center (left end of the diagram) the train would screech at about 20 mph through the sharp curve towards 2nd Street, speeding up to 35 mph along 2nd and through the curve towards Townsend. On that mostly straight bit along Townsend, speeds could pick up to 40 mph before dropping back briefly to 35 mph through the curve to 7th Street, then exiting along 7th Street at 40 mph (right end of diagram). If only one criticism were allowed, it wasn't clear why that final curve should be limited to 35 mph; there was plenty of space at Townsend and 7th to flatten it out to 40 mph, resulting in a simple and efficient stepped speed profile for the approach to Transbay. Fast forward to 2018, and things are much worse. There is a new kink in the alignment where it connects to the existing tracks. The new underground 4th and Townsend station, at the city's request, has been shoved into the Townsend Street right of way in the hope of freeing up the existing rail terminal parcels for high rise redevelopment (where the 2012 alignment might have clashed with new building foundations). The rigid requirement for a straight island platform has resulted in a series of 30 mph kinks in the track. Elsewhere, the speed limit along Townsend has dropped by 5 mph. The designers might argue this is only a few seconds lost, so no big deal, right? How many seconds are wasted? To summarize and simplify, we can assume that every Caltrain will stop at Townsend, so the performance loss is 15 seconds per Caltrain movement, and roughly 20 seconds per HSR movement. That doesn't sound like much, but consider that trains are carrying hundreds of passengers, each of whom are individually delayed. The collective waste of time can be measured by multiplying the train delay by the expected ridership. Today Caltrain has about 15,000 weekday boardings in SF, a number that Caltrain says could eventually quadruple. Let's say it only triples, and that 35,000 of those weekday boardings occur at Transbay and 10,000 at 4th and Townsend (which we won't count) making for 70,000 trips through the DTX approach. That's 70,000 trips x 15 seconds/trip = a million seconds wasted every weekday, or about 3 person-years of productive labor time per month of DTX operation. Over a year, about a quarter billion seconds would be wasted! HSR eventually expects 18 million annual trips originating in the Bay Area, of which maybe half might involve Transbay. Combine that with a similar number of HSR trips terminating at SF, and you get 18 million annual HSR trips through the DTX approach. That would be a waste of another third of a billion seconds. Every year then, about half a billion seconds would be wasted due to careless DTX alignment design. Making up 20 seconds through minor fixes to the DTX track alignment design, before any concrete is poured, is far cheaper and easier and more productive than trying to make up 20 seconds somewhere faster, for example in the Central Valley by running trains at 220 mph instead of 215 mph. The combined annual time savings would exceed half a billion seconds per year. As we watch the cost of the DTX project reach ever more dizzying heights, we should at the very least expect to get more transportation value out of the project. Careless and inexcusable engineering of a rail alignment that wastes so much of everyone's time only adds insult to the injury.